Loose the screws for the aperture or focus lock on a Basler C125 series (LSBR20_ series) lens? This is what you need. 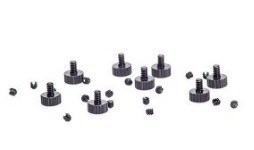 Set includes 8 thumb screws and 16 screw-driver screws.